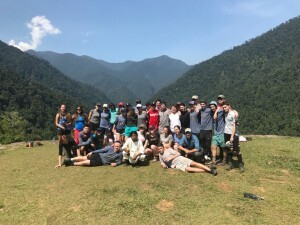 This March break, I, along with 31 of my peers, went on the Duke of Ed gold trip to Colombia where we built a house and went on a five-day hike to the lost city. During the first two days after landing in Bogotá, we aided in the construction of a house in a borough of Bogotá called Soacha. We arrived at the building site early the first morning after a long bus ride from our hostel in Bogotá. After receiving instructions for the day, we began unloading the building materials from the truck and carrying them up a slope to the structure of the house we would be making. We worked quickly on the task and went on our lunch break. Before the workday and during the lunch break, my friends and I had time to get to know some of the people we were working with as well as the people we were helping by building this house. One of the young neighbourhood children, Philippe, came over to the work site to get a look at what we were up to. He got along very well with my classmates and me, and we all ended up dancing, laughing, and talking to him for the majority of our day. Sofia, Tomas, and Camila helped the rest of us by translating Philippe’s Spanish and our English so we could all communicate. Talking to Philippe allowed us to catch a glimpse of what it was like to live in a neighbourhood like Soacha, which has one of the highest concentrations of displaced people in the country due to the civil war between the government of Colombia and the FARC, the country’s largest rebel group. His childhood was, in fact, extremely similar to each of ours! He enjoyed playing sports, hanging out with his friends, and watching superhero movies. We were all very sad to leave by the end of the day, knowing that we would not be able to see Philippe again because he had his first soccer lesson the next day. We eventually said our goodbyes to our new friend and prepared for the long bus ride back to the city. The following day, we arrived even earlier at the construction site and finally commenced building the house. Several people, including some university students from Bogotá not much older than us, helped our group with the construction project. Most of us did not know what to expect from the experience as we had never gone on a community service trip similar to this one, so we relied heavily on the help of these volunteers. They spoke to us primarily in Spanish, which ended up improving all of our vocabularies in the foreign language. One of the younger volunteers helped my friends and I speak to the two children who were living with the recipient of the house we were building. The two kids, José and Maya, were thrilled to introduce me to their other friends in their neighbourhood and loved taking pictures with the camera I had brought. At first, they were slightly nervous to talk to us, but after a while of speaking with the aid of the other volunteers, they both opened up! It was important to get to know the people that we were helping in order to find meaning and purpose in the project and have a connection to the community. This entry was posted in general and tagged community service, duke of edinburgh gold award, Global, independent school, lcc, lower canada college by admin. Bookmark the permalink.